Hey look--it's the first Stargate episode with a semi-obscure reference as its title! Get ready for a science-based plot, readers. SG-1 travels to a planet where it appears to be perpetually night, with SG-3's marines for back-up. A band of Neanderthal-like humans attack them, but the teams are able to scare them off. They encounter a band of normal humans tossing rocks and followed them back to the "Land of Light," the perpetually daytime side of the planet, where civilization strongly resembles Minoan culture. There, they learn the planet's unfortunate situation--occasionally, humans here fall victim to a "curse" that turns them into the Neanderthal-like people, and they are exiled to the planet's night side. That would be all well and good, but when SG-1 and SG-3 return to Earth, the team members begin succumbing to the disease one by one. And then it begins to spread. Dr. Janet Fraiser examines Teal'c and Daniel, both of whom appear to be immune, and sends them back to the planet to get a blood sample from someone untouched by the disease. Teal'c loses Daniel on the night side, but manages to complete the mission. With the sample in hand, Dr. Fraiser determines that the disease feeds on the body's histamine. Since she and Daniel both take antihistamines for allergies, the disease starved in their bodies; she concludes that there must be a strong antihistamine in the planet's diet, and the people who fall to the disease stop consuming it. Dr. Fraiser cures everyone on the base. SG-1 goes back to retrieve Daniel, who contracted the disease once he lost access to his antihistamines, and to take the cure to the people of the planet. As I mentioned above, this is the first episode that bears a semi-obscure reference as a title. In this case, they do explain the title in-episode. For reference, Pierre Paul Broca was a French anatomist and anthropologist, most famous for discovering the area of the brain which controls language. There's some rather problematic research associated with him, but his research on the speech production centers of the brain was revolutionary. It's an appropriate title for the episode, given the subject matter. This is the show's first science-based plot, in that the main conflict revolves around a disease. That'll become a common well for plotlines, with variations to keep it from getting stale. As episodes of Stargate go, this one's nothing special. It's solid, nowhere near the cringefest of "Emancipation," but it's fairly forgettable. The dialogue is OK, with a few good zingers and exchanges between the cast, the beginnings of the tight chemistry they'll develop. They're at least trying with the medical science, even if the physics are sketchy (see below). 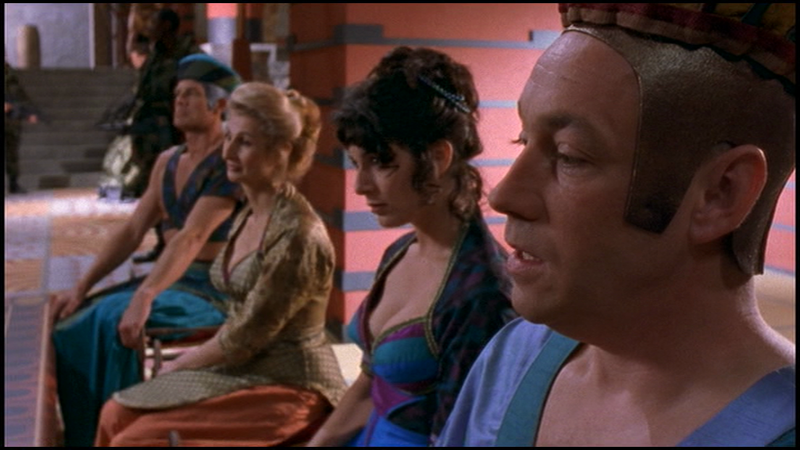 We get another Earth culture cameo, this time transitioning to the Mediterranean. Overall, this one gets a "meh, OK" sort of rating. There's not much here for the core characters' arcs, since this is very much a "planet of the week" style episode. This episode does begin the running joke of Daniel being the series' primary "Kirk" figure; I'd say he gets the most time as a romantic lead. The biggest character note is the introduction of Dr. Janet Fraiser. The good doc will be a staple of the show for a long time and work closely with Sam in particular during many episodes. She's a warm, comforting, almost maternal presence for the show, and yet she'll display many times that she's also tough as nails and incredibly brave. She's a personal favorite of mine, and I love her here, particularly for the scenes with the infected Jack. And Jack/Sam shippers, here's one of your big moments. When Sam's under the disease's influence, she accosts Jack in the locker room. It's one of the first major hints of her feelings for him, which will deepen as the series goes on. Not a ton to comment on here this week, because our "bad guy" is just a disease and a fairly tame one at that. The big door makes an appearance! It's a lot more common in early seasons, but the huge white door to Cheyenne Mountain is often shown closing during quarantine protocol, which we see here for the first time once the disease breaks out on the base. There's not a lot of work in the infirmary or the labs in this episode, despite it being a science-based plot. Unlike later episodes, the solution to this disease is pretty straightforward; it doesn't involve synthesizing any kind of cure. Stepping away from the medicine, let's talk about those planetary physics. Tidally locked bodies are a thing in science; the Moon is a great example. It takes the Moon 28 days to rotate on its axis, and it takes 28 days to revolve around the Earth, so the Moon always shows the same face to viewers here on Earth. It would be entirely possible for a planet to do likewise, with one half always facing its sun. HOWEVER, if that were the case, the dark side would be terribly cold, and the light side would probably be quite warm. We don't see any indication of that here. The stark divide between light and dark shouldn't exist; there should be a twilight zone (haha). There's also no way a forest could grow without sunlight (unless there was some kind of alien photosynthesis substitute, in which case, why do the trees look just like Earth trees). All in all, it's not Stargate's strongest physics moment, despite the series generally playing pretty well with physics. My bestie liked that this episode's concept felt more original than the previous episodes. She still noted that we're disobeying the prime directive, but the outcome here was unequivocally positive, so it was a "better use." Much like me, she thought the physics of the planet were dubious, but she was willing to set that aside for an improvement to the plot.